Where are the Bangladesh ‘death squads’ for the UK government to train? Condemning the British government for its engagement with RAB—without any actual evidence that the training it provides facilitates RAB in violating human rights—risks preventing the organisation from gaining the skills and capacity that might allow it to develop into a human rights compliant organisation, writes David Bergman. THERE has been much in the WikiLeaks cables that is new, revelatory and damning, but the recent ‘disclosure’, published by the Guardian newspaper, claiming wrongdoing by the British government in providing training to Bangladesh’s law enforcement body Rapid Action Battalion is far from being any one of them. If these claims were true, this would, of course, be a significant scandal. Yet, they are unsubstantiated. Unlike the suggestion in the article, it has been no secret that the UK government has provided training to RAB. And, after the Guardian article was published, the news agency AFP reported that, early in 2010, Duncan Norman, Britain’s deputy high commissioner in Bangladesh, had given it an on-the-record interview about the training the British government provided to RAB. Moreover, the use of the term ‘death squad’ is highly sensationalist. However, Human Rights Watch has only once used the term ‘death squad’ to describe RAB and that was in a report four years ago. Since then—despite numerous press releases and a further detailed report on the organisation in May 2009—HRW has routinely described RAB either as ‘an elite crime-fighting force’, or a ‘paramilitary law enforcement agency’. Not a ‘death squad’. And certainly not a Latin American-styled one. And although the Guardian article suggests that HRW is not the only organisation to refer to RAB as a ‘death squad’, no other human rights organisation in Bangladesh or outside has done so. This is not surprising. They know very well that although there is much to condemn RAB for, it is simply not a militia that goes around the country solely engaged in kidnapping and killing people, as suggested by the term ‘death squad’. It is instead a law enforcement agency with over 7,000 officers who spend most of their time dealing with straightforward law enforcement issues. RAB officers are, for example, commonly seen on the roads of Dhaka manning road blocks and the daily newspapers are full of reports of people arrested by them for ordinary criminal offences. It, of course, does have a very dark side. The Guardian is right to report serious allegations against RAB of extrajudicial killings. As it says, RAB has over the years reportedly killed hundreds of people in what are often euphemistically called ‘cross fires’. These need to be investigated, the people responsible brought to justice and the agency itself needs to be seriously reformed. Yet, there is quite a significant difference between a 7,000-man death squad, as suggested in the article, and a law enforcement agency some of whose members have allegedly committed torture and extrajudicial killings. Use of the term ‘death squad’ only prejudices the question of whether or not it is appropriate for the British government to provide RAB training. And there does not seem to be anything contentious about the training itself. This kind of investigation skills training to improve compliance with basic human rights standards is very similar to that provided to the Bangladesh police by the United Nations Development Programme as part of its ‘Police Reform Project’, which is funded by the UK Department for International Development and development agencies of other countries. This has been going on for a number of years without any controversy. 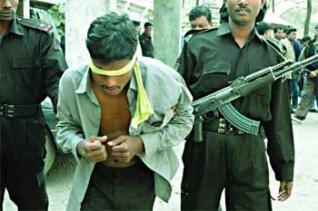 Since the Bangladesh police has been accused over many years by human rights organisations, including Human Rights Watch, of involvement in the systematic torture of detainees to extract confessions, those critical of improving RAB’s investigative skills should also want to end the police training. To do this though would be entirely counterproductive. A key reason why such organisations as RAB and the police are involved in torture is that these are the only methods by which the organisations know how to investigate crime. In Bangladesh, crime scenes are almost never kept, techniques like finger printing are not used, and cases are not built up on the basis of deductive inquiry and questioning. Both RAB and the police, simply detain people, and carry out investigations by coercion, torture—and sometimes killing. It is, therefore, essential that these organisations understand that crimes can be solved without torture. Criticising the British government for providing training removes the possibility that these agencies will ever learn how to investigate crime using the human rights compliant techniques standard in the UK and other countries. And, interestingly Human Rights Watch, in its most recent report on RAB states that international donors like the British government can provide training as long as it is ‘specifically for human rights’. Human Rights Watch has not responded to a query about why the training by the British government does not constitute the kind of ‘human rights training’ it supports. The only suggestion in the Guardian article that the training provided by the British government was not human rights training comes from a comment by the RAB’s head of training, Mejbah Uddin ‘that he was unaware of any human rights training since he was appointed last summer.’ It is notable, however, that the Guardian does not set out what training was in fact provided. It is very likely that Uddin’s response simply reflects a different understanding of what constitutes ‘human rights’ training, not recognising that it includes learning about the maintenance of crime scene and investigation techniques. There is a purist view that donor agencies should not engage at all with organisations involved in human rights violations, that any engagement simply provides them unhelpful legitimacy. And there may well be questions to be asked of the British government about how much pressure it put on the Bangladesh government to stop torture and extrajudicial killings by RAB. However, condemning the British government for its engagement with RAB—without any actual evidence that the training it provides facilitates RAB in violating human rights—risks preventing the organisation from gaining the skills and capacity that might allow it to develop into a human rights compliant organisation. This makes it all the more remarkable that British lawyer Phil Shiner has initiated legal action against the British government. One would expect lawyers of Shiner’s reputation—who made his name in taking action against the British government over killing of citizens in Iraq—to undertake their own due diligence before opportunistically filing legal papers based on a misleading newspaper article.